In The Train: RFK’s Last Journey, an exhibition at Les Recontres d’Arles, photographs shot from RFK’s funeral train in June of 1968 take on new political relevance. ARLES, France — Senator Robert Kennedy was shot at the Ambassador Hotel in California shortly after midnight on June 5th, 1968. Twenty-six hours later, he was dead. His body was brought back to New York City and lay in state at St. Patrick’s Cathedral on June 7th and June 8th. 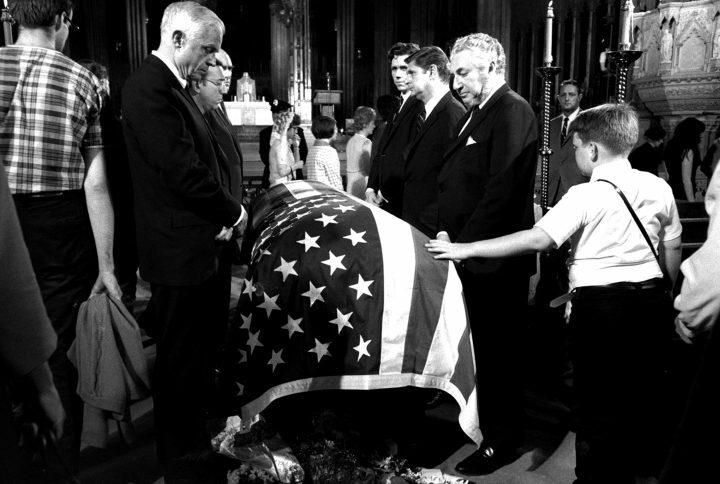 The Cathedral was open to the public for two days and people waited six to eight hours in the sweltering heat, in a line that stretched twenty-five city blocks, to gain entry to the Cathedral and walk past his flag-draped casket. On June 7th, 1968, a week after my fifteenth birthday, I got up in the morning and dressed in my favorite mini-skirt. It was baby blue and covered in a pattern of small white squares. It had a matching tank top. I boarded a bus in suburbia that took me to the Port Authority Bus Terminal in New York City, and from there, I made my way to St. Patrick’s Cathedral and joined the throng waiting on line to file past Robert Kennedy’s casket. It was 80 degrees a little after 10:00 a.m. and just over ninety by 1:30 in the afternoon. I was alone, completely inappropriately dressed to visit a Cathedral and without even a bottle of water. But being young and alone had advantages. I managed to gently cut in line several times and made it into the Cathedral in a record three and a half hours. What happened then is mostly lost to memory except for the fact that I was sure I had touched Kennedy’s casket when I walked past. In our current security-conscious age, that seemed to me to be a made-up recollection. But after googling around, I found this image of a young boy with his hand on the casket and concluded that the recollection must be true. St. Patrick’s Cathedral was closed to the public at 5:00 a.m. on June 8th. High Mass was celebrated at 9:55 a.m. At the conclusion of Edward Kennedy’s eulogy for his dead brother, the casket, accompanied by a 75 car cortège, was taken to Pennsylvania Station, where it was loaded onto a 21-car train. The train departed behind schedule at 1:44 p.m. It was due at Union Station in Washington D.C. at 4:20 p.m. It arrived at 9:09 p.m. The Train: RFK’s Last Journey, an exhibition on view at Atelier des Forges, in Arles, is produced by the Museum of Modern Art, San Francisco, in collaboration with the Rencontres d’Arles, an annual summer photography festival. Curated by Clément Chéroux and Linda B. Lehtinen, it is an exhibition in three parts. The first presents the photographs of Paul Fusco, originally shot for Look magazine, in 1968, from the window of the train that carried Robert Kennedy’s body to Washington D.C. for burial at Arlington National Cemetery. The second part is a display of snapshots and home movies, collected by the Dutch artist Rein Jelle Terpstra, that were taken by people who watched the train pass by on its journey to Washington. The third part is a lavish 70mm film recreation of the train’s journey, by French artist Philippe Parreno, who said his film “shows the point of view of the dead.” Both Terpstra and Parreno were only eight years old when Kennedy was shot. In an interview for the book The Train (Éditions Textuel, 2018), which accompanies the exhibition, photojournalist Paul Fusco explains why he was on that train with Kennedy’s coffin: “On the morning of the day of the funeral mass for Bobby at St. Patrick’s Cathedral I arrived at the Look office and my editor looked up from his desk and said: ‘There’s a High Mass for Bobby at St. Pat’s. They’re going to put his coffin on a train at Penn Station for Washington. GET ON THAT TRAIN.’” Fusco describes his astonishment when the train emerged from the underground tunnels leading out of Penn Station and he saw hundreds of mourners on the platforms, waiting to pay their last respects to Robert Kennedy. Fusco then pulled down his train car window and began shooting photographs. He continued to photograph the people gathered at the side of the tracks to bid Kennedy farewell until the train arrived at Union Station. It was the size of the crowds that forced the train to slow down, delaying its arrival in Washington by over four hours. Of the 2,000 pictures Fusco took, just one was published at the time. Paul Fusco, Untitled, from the series “RFK Funeral Train,” 1968. © Magnum Photos, courtesy Danziger Gallery. The impact of these images is difficult to articulate. My first response was to feel overwhelmed. On my visit to the exhibition in Arles, I was near tears — not usual for me. The images depict the reaction of an entire country to loss. Not just the loss of Robert Kennedy as an individual, but also the loss to the country of a hopeful and inclusive political vision. Hours before he was assassinated, Kennedy had been declared the winner in the South Dakota and California presidential primaries. A progressive set of ideas about governance was at stake in the 1968 presidential election, and the hope for their fulfillment was instantly dashed. Instead, we got the poisonous vision of Richard Nixon. The sixties were an endless rollercoaster of shocking and violent incidents, including the assassination of a sitting President; the murders of Medgar Evers and Martin Luther King, Jr.; the brutal killings of James Chaney, Andrew Goodman, and Michael Schwerner; the endless rows of GI caskets arriving at Dover Air Force base from Vietnam; and the 16th Street Church Bombing, to name just a few. It was against this backdrop that Robert Kennedy emerged as the more liberal presidential candidate he’d become by the time he was killed in June of 1968. The Train takes place on the 50th anniversary of Robert Kennedy’s death, which is also the 50th anniversary of the political unrest that erupted in France in the spring of 1968. That May, massive general strikes, factory protests, and university occupations across the country brought the French economy to a virtual halt. Another exhibition at the Rencontres d’Arles, titled 1968, What a Story!, looks back to the events of that tumultuous year. 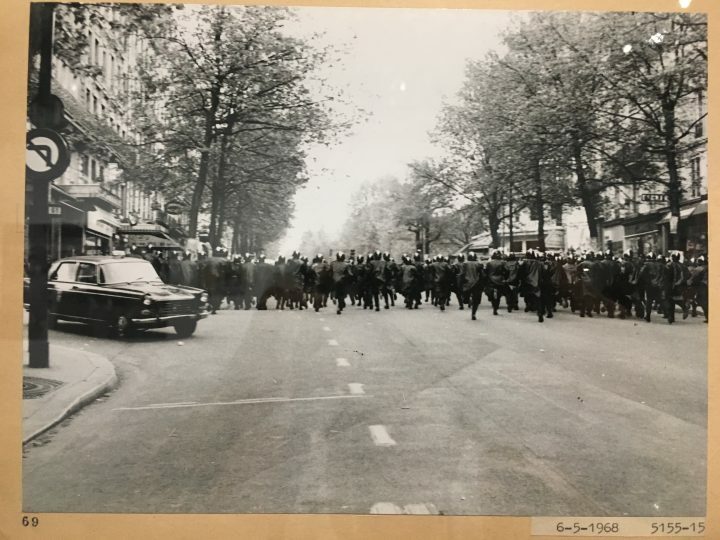 On view at the Croisiére, this exhibition features archival photographs of the protests, letters from the chief of police to his officers, and other documents culled from the Paris Police Prefecture Archives, Paris-Match, the popular French-language news weekly, and Gamma-Rapho-Keystone, a combination of several French photo agencies. It even includes the letter expelling the radical French student organizer Daniel Cohn-Bendit from France. Cohn-Bendit, seen as a heroic figure in France, was interviewed in numerous French and American publications this May. The events of May ’68 in France, which unfolded for several weeks before the Kennedy assassination, resonated in America with antiwar protesters and Civil Rights Movement protesters. In this current moment of complete political despair in the United States, there could hardly be a more poignant visualization of lost hope than the photographs of Paul Fusco. It is not only the size of the pictured crowds that astounds, but also their diversity. There seem to be people of all classes standing on the train platforms. There are tiny children and old men. White people and black people are standing together. It isn’t easy for me to imagine any white politician now who could galvanize the African-American community in the way that Robert Kennedy did at the time of his death in 1968. This was a moment when things could have turned out differently; a progressive government married to the ideals of the young in the late ‘60s might have reshaped the American landscape in ways we cannot even imagine now. What we got instead was Richard Nixon: a paranoid and a racist. While his domestic policies were, in retrospect, not much different than those of current day Democrats, he believed, as does Trump, that he was above the law. It seems that all the people who left their houses that morning to head to the train tracks recognized the enormity of the loss taking place, and each of Fusco’s beautifully composed photographs resonates with that loss. It’s difficult to walk out of the rooms of Fusco’s vivid photographs and into the rooms of home movies and snapshots taken by people who watched the train go by on that hot June afternoon. It’s fun to think about how artist Rein Jelle Terpstra might have gone about finding these people and collecting their images, but this part of the exhibition felt more like a curiosity, a small idea tacked on to a really big one. I don’t dismiss the notion of documenting what people saw, but to me, that has already been documented in Fusco’s images. It is reflected on the faces of all those people in the way that a camera can be reflected in the eyeball of a sitter. French artist Philippe Parreno’s film, titled “June 8, 1968”, is a lavish 70 mm color print that looks (and probably was) expensive to produce. Projected on an entire wall of a dark, carpeted room, it reenacts the journey of the train that carried Robert Kennedy’s coffin to Washington D.C. As the train lumbers along the rails, we see tableaux of people beside the tracks, arranged as if in Fusco’s photographs. If the film is meant to show us “the point of view of the dead”, as Parreno claims, that ambition is successful. The film is soulless. I feel sympathy for both Parreno and Terpstra and their obsession with Kennedy’s funeral train, but somehow, neither of their works feel like more than a conceptual conceit without a payoff, especially when juxtaposed with Fusco’s photographs. At a time when the authenticity of all forms of media is constantly questioned, and photo-editing techniques have reached a point where anything can be fabricated or simulated on a computer, we barely think of indexical photographs as documenting the real, because we are no longer sure what the real is. And yet, Fusco’s photographs seem real. To borrow from a famous quote by Salman Rushdie, “The world … is the place we prove real by dying in it.” Robert Kennedy proved the world “real by dying in it,” and Fusco was there to document the country’s reaction to that death. Why did I go to St. Patrick’s Cathedral on June 7th, 1968? It’s hard for me to say now. It’s not as if I had been an ardent Kennedy supporter, or especially politically astute at that age. My parents were Holocaust survivors and I saw them as having an intimate relationship with history. They were part of the biggest, most dramatic and important event of the 20th century. I often lay awake at night as a young child wondering what I would have done as an actor in the drama of their young lives and a part of me envied them. Maybe, by the time I was fifteen, in my mind, I saw the Kennedy assassination as a serious historical event, and I wanted to be sure I was a part of it. The Train, RFK’s Last Journey continues at Atelier Des Forges (24 Avenue Victor Hugo, 13200 Arles, France) through September 23.